The latest vaccine indications are available at your fingertips. Know in advance the right vaccines for your child and protect them. Vaccine App is a vaccination reminder and awareness to help parents all around the world and to keep track of immunization of their kids for better health. Vaccine App has been developed by considering worries of parents and this tool is for parents to maintain their kid’s past and future vaccines to ensure their children are fully immunized on time Vaccine App reminds parents about importance of vaccinating their children on time, provides a range of tools and resources to make this easier. 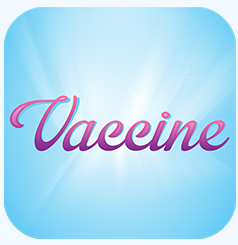 Vaccine App provides a complete chart of the vaccines that your child needs. Old vaccination details will be listed, which will be useful for the parent to be aware of the vaccines taken already and it can be tracked, if there is any vaccination date forgotten. This can be utilized for the government records as well(I.e. School). Vaccine App is not only designed for Parents, but also for worldwide Ministries of Health, to track timely vaccination of kids and thus protect them from serious vaccine preventable diseases. Vaccine provides a complete chart of the vaccines that your child needs along with the ages at which it should be taken. Old vaccination details will be listed which will be useful for the parent to be aware of the vaccines taken already and can track if there is any vaccination date forgotten. This can be utilized for the government records as well. Taken vaccinations could be marked among the older vaccinations. There is also evidence that some parents are having their children vaccinated later than the recommended ages, often due to time pressure and busy lives. This delay means children are unprotected from serious diseases. Vaccine App reminds parents about the importance of vaccinating children on time, and provides a range of handy tools and resources to make this easier. 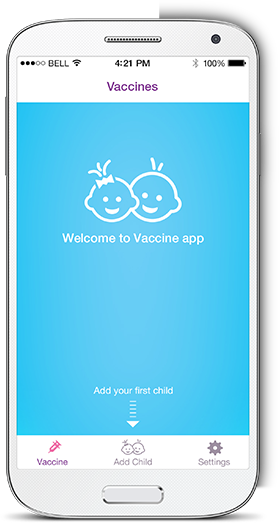 Users of The App will also have access to reliable expert advice and information about vaccines, with resources covering vaccines for infants all the way to international travel vaccines. 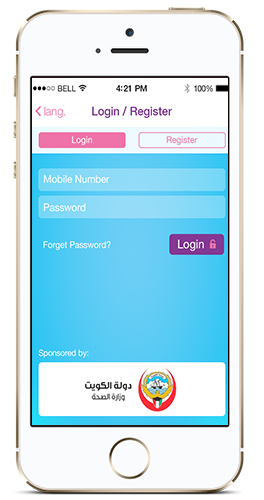 The App has flexibility to add, update register children. 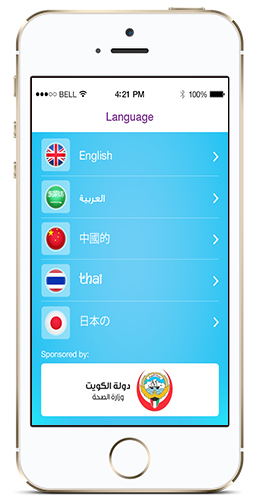 Seamlessly switch from one language to another. User has to register for an account to start using the application. Once the registration form is submitted with email ID and telephone number, user will receive an email and an sms with the activation code. Use the registered mobile number as username and the activation code as password to login. Once logged in, users can create their children’s list with the date of birth and other information needed. Those information could be edited any time. Once the child account has been created, the application starts tracking the child’s vaccinations and alerting the user whenever required. Vaccine app will calculate the next immunization due date and send a series of reminders to prompt the parent to be prepared for each immunization. User can reset his/her account credentials in preferences page which is available under more tab and keep logged in by enabling login option in preferences.